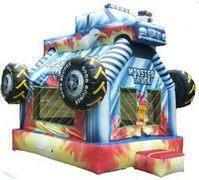 This is quite a neat bounce house shaped in the form of a Monster Truck! Every boy loves trucks and that’s why this is our most popular standard moonwalk rental. Whether you live in city, the suburbs, or in a rural area we want to be your party rental vendor of choice. We are fully insured, Department of Labor. Our event planners as well as delivery crew are very friendly and make any experience wonderful! Give us a call today and we can reserve the Monster Truck moonwalk for you. The Monster Truck moonwalk rental measures 15’Lx17’Wx17’H but we do ask that the customer provide a total area that is at least 17’Lx20’Wx19’H in order to ensure the moonwalk fits. This moonwalk is geared for kids kids of all ages. We only ask the customer to provide full supervision for the duration of the event as well as (1) 20amp electrical outlet within 50ft of the Monster Truck Moonwalk. You will be impressed by the awesome graphics that the bounce house has. This moon jump is rectangular shape and may be the right choice for you if you don’t have a square area to set it on. If you are looking to have a package for your upcoming event call one of our sales representatives today! They will be more than happy to recommend some of our many rentals that will follow the ‘monster truck’ theme! Call and book today!